Our final statistics post of the year is dedicated to to the incredible Google Summer of Code (GSoC) 2016 mentors. There were a total of 2,524 mentors, but today we'll look at the 1,500+ mentors who were assigned to an active project. Mentors are the lifeblood of our program. Without their hard work and dedication to the success of our students, there would be no GSoC. A merry band of volunteers, mentors work with students for more than 12 weeks — remotely, across multiple time zones, giving their time, expertise and guidance in addition to a regular full-time job for an average of 7.45 hours a week. Today we’ll take a closer look at our 2016 team. 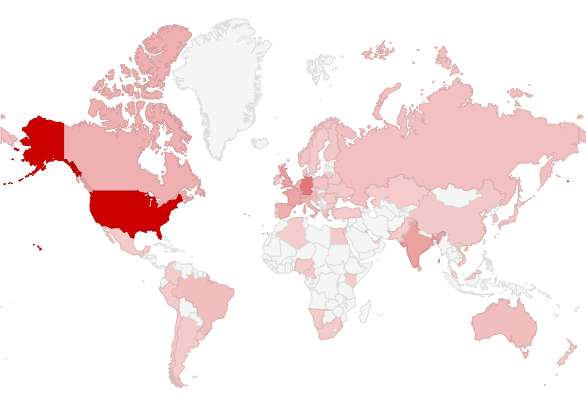 GSoC 2016 mentors reside all over the world and represent 66 countries. Want to see the data? 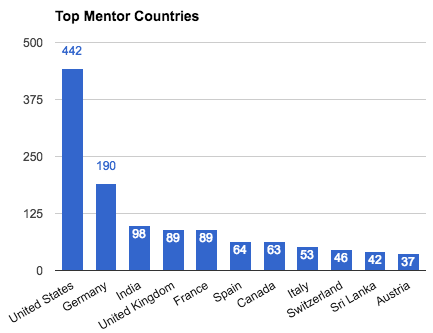 Here’s the breakdown of the countries our mentors come from. Awww, we love you too Bart! There are also plenty of newbies to the program each year and 2016 is no exception. We’d like to welcome 528 (33%) new mentors to the GSoC family. At the end of each program year, we invite two mentors from each participating organization to join us at the Mentor Summit, a three day unconference at Google HQ in Northern California. There they enjoy a weekend with their peers to talk about all things open source-y (a technical term) and have some fun. A huge thanks to each and every Google Summer of Code mentor. We salute you.